There are many times throughout the year when the sky above the city of Montreal is illuminated by brilliant firework shows—from Canada Day celebrations to the annual International Fireworks Competition. But the best places to see Montreal fireworks offer unparalleled views, great crowds, and fun activities as well. While there will be plenty of rooftop parties and private events throughout the city that charge a cover fee, you can get a great view from a number of local spots around the city without paying a penny. From Parc Jean-Drapeau to the Concorde Bridge, there are plenty of possible vantage points that are accessible free of charge, though a couple of venues on this list may ask you to buy some food or drinks. Whether you're staying in Old Montreal near the fireworks at one of Montreal's best hotels or you've just moved to the city, viewing the show from one of these destinations is sure to make your holiday a memorable one. Located on an island to the east of downtown Montreal, Parc Jean-Drapeau is a great place to spend the day before settling in for the fireworks shows at night. With weeping willow trees, gardens, art installations, a casino, and La Ronde, the amusement park where the Montreal Fireworks Competition magic comes together, Parc Jean-Drapeau is the closest you'll get to the action during the event without paying to attend. However, if you don't mind paying, you can buy tickets to see the Montreal Fireworks Competition. You can access La Ronde and the park by taking the Montreal Metro to the ​Parc Jean-Drapeau Station. Directly across the water from Parc Jean-Drapeau, on the shore of Montreal, Clock Tower Beach in the Old Port neighborhood is a perfect spot to enjoy a glass of bubbly while watching the Montreal Fireworks Competition in action. However, this spot fills up fast as a lot of locals prefer to come here, so plan on arriving at least two hours early to get a seat. In 2018, there is a small admission fee for the beach itself, guests must be 18 or over, and there will be a bar available on-site. You can access Clock Tower Beach from the Champ-de-Mars Metro station. Head over to the waterfront side of Old Port and stand just about anywhere for a good view. This option is fairly easy to find—just head toward the water from the Champ-de-Mars Metro or Place d'Armes Metro. Every year, Jacques-Cartier Bridge closes off to car traffic two hours before the fireworks start, at 8 p.m., to allow tourists and locals alike to view the show from atop the bridge. While this is a great opportunity to get a unique view of the city, you will have to walk a fairly long distance from the closest metro stop (Papineau Metro). The bridge will also likely be crowded as this is one of Montreal locals' favorite spots to see the show. However, unlike Old Port, which has many exit points allowing the crowd to quickly disperse, there's only one way to get onto and off of the Jacques-Cartier Bridge. So if fireworks end at around 10:30 p.m., don't be surprised if it's 11:30 p.m. by the time you and your fellow gawkers are back on land. While not technically free as you have to purchase a drink to be there, the rooftop terrace at Auberge du Vieux Port hotel, known as the Terrasse sur l'Auberge, is the rooftop terrace to beat all rooftop terraces in Old Montreal when it comes to catching the perfect view of the fireworks. However, you will need to book a table at least a week in advance to make sure you get a spot to see the fireworks while sipping on a cocktail or glass of wine. Note that the rooftop offers tapas and appetizers but not full meals. Auberge du Vieux Port is closest to the Place d'Armes Metro in the Old Port neighborhood of Montreal. You don't need to see the fireworks up close to truly enjoy a spectacular view. 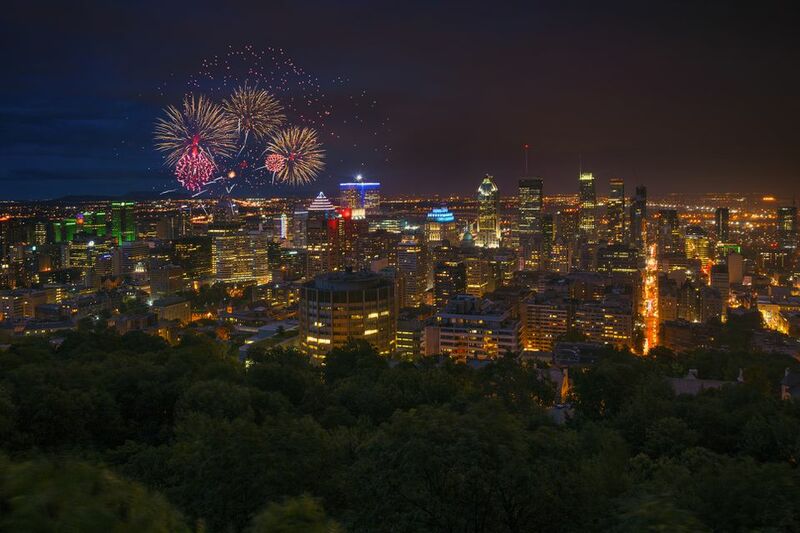 If you're a fan of hiking and birds-eye views of Montreal, Mount Royal Park's Belvédère Kondiaronk offers a great overlook where you can catch the entire city lit up by the fireworks show. It's about a 15-minute walk from the mountain's parking lots or the Bus 11 stop, but on a gorgeous summer night, this is a great way to see the fireworks. A temporary outdoor summer installation, not only does the Village Au-Pied-du-Courant offer an incredible view of the fireworks and the river, but it's also a comfortable spot to be with sand, lounge space, music, and plenty of nightlife potential; food and drink are also sold on location. It's basically an urban design experiment using an abandoned city lot that was so popular in its first year of operation in 2014 that the concept stuck. You can take the Montreal Metro to Papineau Station then walk toward the waterfront to get there, but make sure to arrive well before the show to make sure you get a good spot. The problem with the Concorde Bridge is it's not the most accessible vantage point. By foot, you have to be coming from Parc Jean-Drapeau Metro Station and by car, you have to find a nearby parking spot and then walk it, making the best way to reach the bridge by bike. The reward for bending over backward to get here, though, is that it's far less crowded than the ridiculously popular Jacques-Cartier Bridge and is a little closer to the show itself. You couldn't ask for a better view of the city and the fireworks than the one you get at Au Sommet PVM, a 360-degree observation deck on the 46th floor of downtown high-rise building Place Ville-Marie. However, this attraction does charge admission, even during the fireworks show. The only way around paying admission is to book a table at Les Enfants Terribles on the 44th floor. The view is just as amazing and it's less crowded than standing on Jacques-Cartier Bridge or at the Old Port. The only caveat here is even though admission is technically free, you do have to order food and drinks.